Header bidding is a new technology that allows publishers to offer their inventory through a unified auction, before calling on adservers and advertisers to select impressions with the highest priority, using programmatic advertising platforms. This means that advertisers can compete for multiple placements by a publisher dynamically and in real time, and see 100% of their stack. Unlike traditional real time bid auctions, where ads have their own auction one at a time and with low priority in the adserver, in header bidding advertisers have the ability to make multiple bids at the same time, with the highest priority in the adserver. Header Bidding is beneficial for both publishers and advertisers. Publishers can access multiple requests and increase their fill and earn rates, while advertisers can access more inventories and access more chances to reach their target audience. 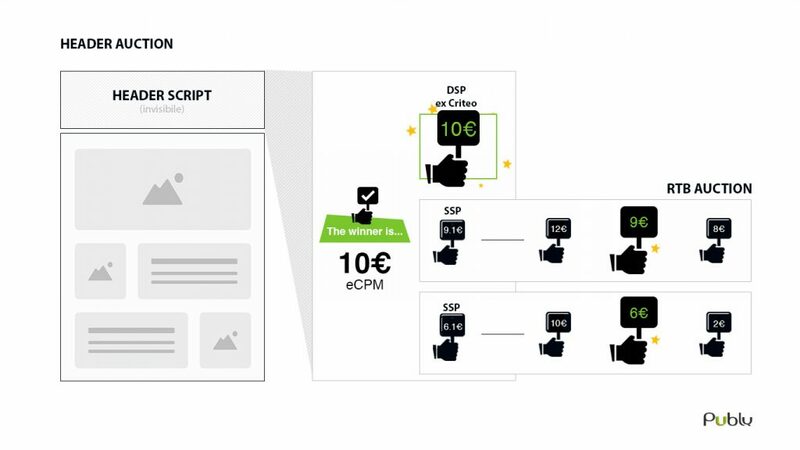 Greater CPM: at the same instant, publishers can receive offers from advertisers who are interested in their inventory and willing to pay a higher price than the advertisers present in the ad server. The greater the number of advertisers available, the greater the chances of filling all the available inventory types. We guarantee 100% coverage with the combination of header bidding and waterfall technology, maximising revenues for inventories, which are filled with high quality requests. Header bidding is designed to smooth out and reduce the use of technologies based on “waterfalls”, in which an attempt is made to maximise revenue by creating a “cascade” of potential buyers. In header bidding, the ad call is sent simultaneously to all bidders in an auction before it takes place, and the winner is determined before the impression is delivered. Our technology allows our invocation codes to be inserted into pages easily. The result is asynchronous banners, offering more fluid browsing and a reduction in page loading times. It allows publishers to integrate with multiple advertisers more quickly and easily, increasing the range and variety of requests available to them. The competitiveness between the different bidders for the same page at the same time means that the average price rises and the earnings are greater. It offers greater transparency regarding the value of impressions, as publishers can see the actual value of their advertising space. Greater control and transparency of bids make it possible to report on and optimise the whole system. Many publishers rely on Google’s DoubleClick for Publishers (DFP) technology for their advertising spaces. This tool has certain limitations in terms of selecting the best offer. In fact, Google does not compete equally with other bidders, but rather it gives priority to bids on its adExchange network. In this way, the bid with the highest CPM does not always win and the publisher earns less. Our header bidding system guarantees high-level performance and is also completely unrelated to DFP, providing the competitive selection of bids on the basis of the CPM, optimising earnings and raising the average bid price. Are you simply interested in applying the technology to your bidders? Implementation of header bidding on the part of publishers can be daunting, especially for those with limited resources. If you are a publisher and you already have your own bidders, you can rely on us by using our technology and our resources. You will be able to view all the bidding header auctions running on your website. You can monitor the performance of the headline bids daily, hourly and even in real-time, in a completely transparent way. At any time, a team will be on hand to help you manage your bidders and support you in case of any problems. Our resources combined with our consultancy will allow you to optimise your profits and raise the value of your advertising space. By entrusting your bidders to us, you can also enjoy 100% coverage of your advertising spaces. In the event that none of your bidders is interested in buying your advertising space, our system will intervene by displaying valid alternatives. In this way, every impression will be covered by a banner and you will not lose anything. Do you want to take advantage of the benefits of Header Bidding but don't know where to start? Go to the control panel and contact us via the support system. You will soon be contacted by appointed person, who will explain all the steps necessary for implementation. Rely on a consolidated company that is constantly growing and evolving. Register as Publisher now and discover the great benefits we can offer you. Use the space below to contact us AND a Publy representative will contact you as soon as possible.